Over the past couple of weeks woodworking HQ has been a frenzy of sanding, buffing and swirling as we started to see our reflections appear in what must be the most loved pieces of veneered MDF in history. As always we had expert tuition from John as he took us through the principles of finishing which basically broke down into two camps. 2. those that can be worked with after application and in the future. As a restorer John gave some insight on how to repair water marks, match colour and identify the original finish used to deal with repairs, its fascinating to learn the tricks of a craftsman. One rather dramatic solution to removing water stains/rings from wood involved wiping on methylated spirit and setting it alight; think the Christmas pudding effect on your cherished table. This is not something for the faint hearted or to try at home even if you are brave. I would suggest that you wait for me to get some more experience under my belt before inviting me to do this for you. The trend in most modern furniture is to spray with plastic and acrylic finishes, the serves to protect the wood against hot drinks, enthusiastic children and day to day use. I find this quite sad, what you get with protection you lose with character and feel, let wood be wood and not plastic. The other school of thought is to use Danish Oil which is easy to apply and maintain (simply rub on a few coats), this gives a matte look and is more naturalistic. Between the two camps is the use of Shellac and waxes which are both natural products. Shellac is used for French Polishing, this takes skill and patience to perfect but the results are stunning; you can achieve a wide spectrum of finish from a soft sheen to piano mirror. Shellac is a secretion from the Kerria Lacca insect and has many uses including fabric dye, medical/drug manufacture - that shiny coating on tablets - and for furniture polish, quite incredible little bug really. Peter, our friend from Portland, working on a board with a split finish, shellac and grain filler on the left and pure grain filler on the right. Its amazing the different effects you can create at the finishing stage. Guy applying pumice with shellac - This fills the grain to create a translucent and shimmering surface. Pumice is known as the Rolls Royce of finishes, it takes technique and a careful touch to ensure that the pumice sinks into the grain without taking off the layer of polish, its a 'less is more' principle which creates a stunning finish, oh and thousands of swirls and sweeps of the cloth - known as the rubber. 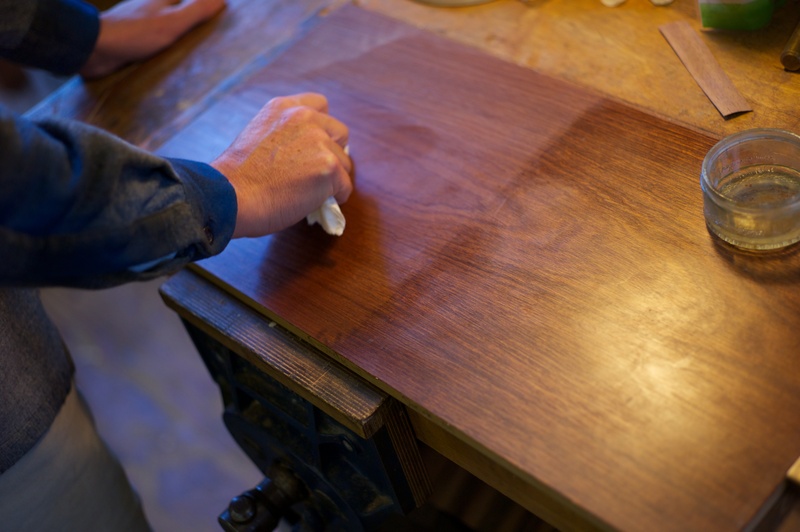 This is painstaking and careful work and true french polishing. 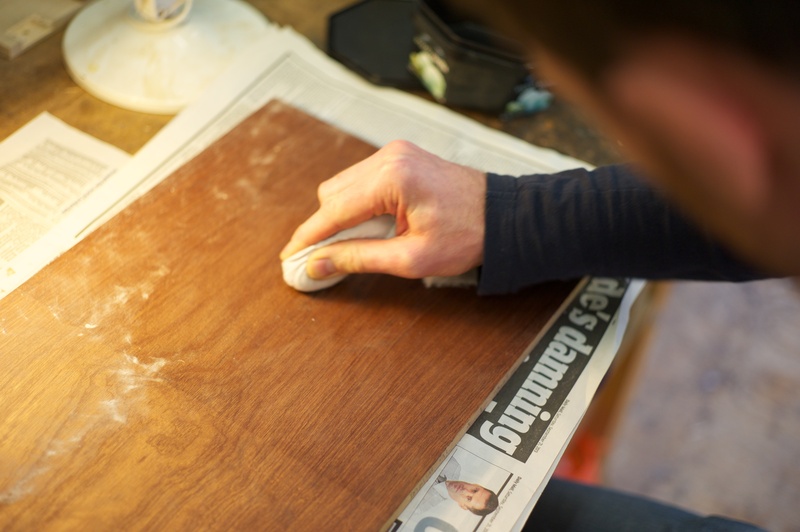 All in all we have applied most types of polish to nearly a dozen pieces of veneered MDF, the next stage is to work out the most suitable finish for our in-lay boards and boxes. I will post updates on this once the box is finished. I shall also pen a few words on repair and touching up marks and dings, part of the learning process has meant that my pieces have developed the scars of the novice. Upon reviewing my work to date, John kindly assured me that most things can be rectified through polishing, the hours spend making something good again might not be that practical... currently it's all part of the learning.